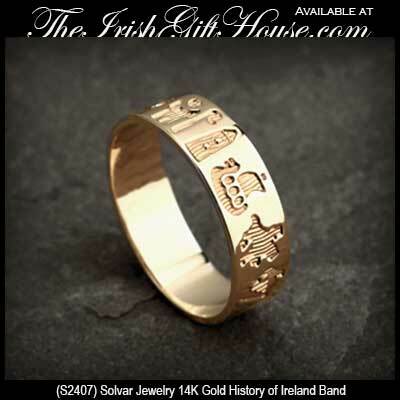 The gold History of Ireland ring is cast in 14K and it is an 8mm wide comfort fit band. The History of Ireland gold ring is available in both women's and men's sizes that range from 5 to 14, including half sizes, and it is gift boxed with a legend booklet that explains the symbolism of the icons. The History of Ireland jewelry is made by Solvar Jewelry in Dublin, Ireland and it is available at The Irish Gift House.